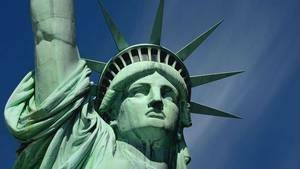 The Statue of Liberty is a symbol for the United States but also in the World, where it is internationally recognized and mostly celebrated as a key representative of the freedom of peoples. As such it was the subject of several official events during its history, the most important of all is undoubtedly its inauguration. 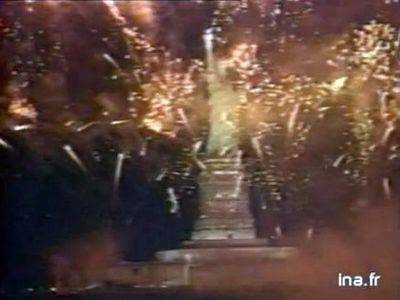 This grandiose celebration was held October 28, 1886, and its progress is explained here: Inauguration of the Statue of Liberty..
Erected in 1886, it is in 1936 that the Statue of Liberty celebrated its 50th anniversary. This anniversary was celebrated with great dignity ceremony in which participated a lot of people and was chaired by Theodore Roosevelt himself. During the day he made a memorable speech in which he insisted that the American nation was built on immigration and which constituted her heart. But he considered this fact as finished, for him the nation was constituted and had no need of newcomers. This is the reason for the halt to immigration during the years 30. It also said "Freedom and peace are two living elements. In every generation, for they are maintained, they should be preserved and revitalized." The holiday Itself Was undoubtedly great, but it must be Said That Some events do-have survived. Note the presence in New York of Mr. Richard, mayor of Colmar, and Mr Leopold Netter, curator of the museum of Colmar. 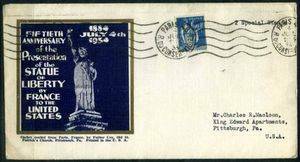 The US position HAD participated in the event by publishing special envelopes bearing the picture of Miss Liberty. 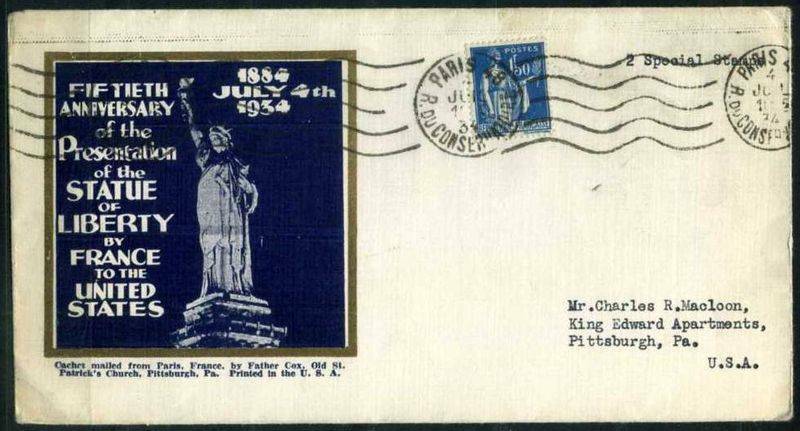 Postal envelope bearing the image of Miss Liberty. The result was for the benefit of our country, a rejuvenation of the memory of our participation in the independence of the United States and a new affirmation of the community of our views and our aspirations for political institutions. This is by far the largest of the three ceremonies in honor of the Statue of Liberty. She had been prepared two years in advance, with the renovation - which was not a luxury - and the renovations of the islands and public reception structures. The work lasted from 1984 to 1986 and was not completed until shortly before the ceremony. The Americans put the package for this feast: That's all the Hollywood know-how that was implemented specifically for these four intensive days. It began Thursday, July 3, 1986, the eve of the anniversary, on governors island, at 20h. This island was chosen to host the main stage of the ceremony, a giant multi-level stage with sweeping views of the Statue of Liberty. Stood the present Secretary of State for the Interior, head of the agency holding the statue, producer David Wolper, who organized the 4 days of ceremony and Iaccocca Lee, president of the foundation "Statue of Liberty-Ellis Island ". 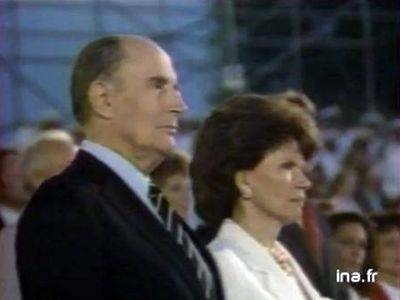 After a quick speech they introduced the master of ceremonies, US President Ronald Reagan, who came with her guest François Mitterand, then president of the French republic. 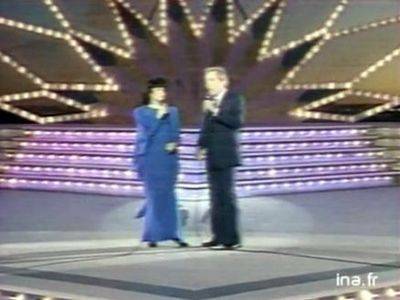 If followed by the US National Anthem, sung by Jose Feliciano and Elizabeth Taylor came on stage to explain how the statue was important to her, and finally it was Frank Sinatra who has tried this exercise. The following events put into play that Ronald Reagan made a speech in which he magnified the relations between the two countries and highlighted the workers who had worked on the restoration of the statue. He took the opportunity to draw the history of the statue of its construction to the present. François Mitterand was invited to say a few words, that it essentially made in French, and said, smiling, "Happy birthday United states", followed by "Happy birthday Miss Liberty". The applause was rather even longer than his speaking was short. The evening continued with a show alternating songs, dances and speeches show in which Neil Diamond, Frank Sinatra, and Mikhail Baryshnikov occurred. Then came the big moment. Transferred aboard the USS John F. Kennedy and then it was already dark, Ronald Reagan spoke, then triggered the lighting of the statue, revealing to the public. The light began to illuminate thanks to a laser beam the torch, then it is the whole of the statue, including pedestal, which was illuminated. At the same time a fireworks burst above the monument, and governors island was sung "The Star-year Stripes Forever" by the "Liberty All-American Band", a choir created for the occasion. 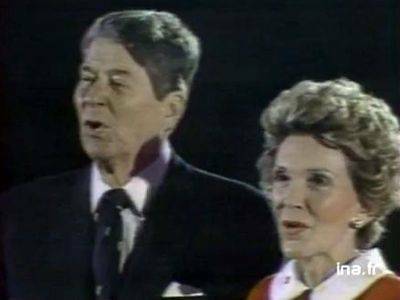 At the end of the concert and the fireworks, President Reagan passed over to Warren Burger, Chief Justice, who naturalized mass 16,000 people across the country. 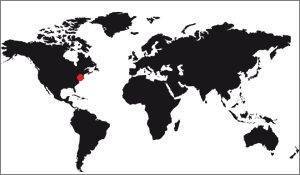 This feat was achieved by satellite links made with Miami, St. Louis, San Francisco and Washington, but a few of them were physically present to take the oath. It must be said that even if the famous Statue of Liberty, she has always been associated with US immigration. It was therefore natural that in such a ceremony is held during the "Liberty Weekend". This July 3 was a beautiful summer day, with particularly high temperatures but a refreshing sea breeze which raised thousands of visitors to better stand the wait. It must be said that said that the population of New York had doubled in size to the festivities, and even though this is probably an exaggeration, the fact remains that the city was teeming with tourists. It was during the 2nd day there took place three significant events: The boat parade, a concert of classical music and the fireworks. Perhaps, indeed, these vessels embody our conception of liberty itself: to have before one no impediments, only open spaces; to chart one's own course and take the adventure of life as it comes; to be free as the wind – as free as the tall ships themselves. It's fitting, then, that this procession should take place in honor of Lady Liberty. During the day the patrol of France gave a demonstration of her skills over the statue in New York Bay. This show was part of the tour of France to patrol US tour which lasted 7 weeks. In the evening a concert was held by the "Boston Pops Orchestra" directed by John Williams, on the lawn of the Liberty State Park in New Jersey. This place was chosen because it was the largest he could get esplanade near the statue itself. During this concert some personalities pop song or other styles came on stage: John Denver, Melissa Manchester, Clamma Dale Simon Estes, Joel Grey, Whitney Houston, Johnny Cash, James Whitmore, and Barry Manilow, basically. Significant made the trip, as the mayor of New York or the governor of the state, but also some show business personalities. In the evening Ronald Reagan, still aboard the USS John F. Kennedy, unleashed fireworks which remained the largest in world history. It lasted for 30 full minutes and consisted of 40,000 rockets fired 42 barges scattered all around the statue. The weather was favorable, the sky was clear, pleasant temperatures and the wind blowing that day had calmed down a bit, which contributed to its success. Even today some remember well it really impressive sight, it seems. In 1986, Nancy Reagan inaugurated the new facilities of the statue. The 3rd day of the weekend was marked by the official reopening of the statue. Closed since the beginnings of the work in 1984, it was opened in the morning. 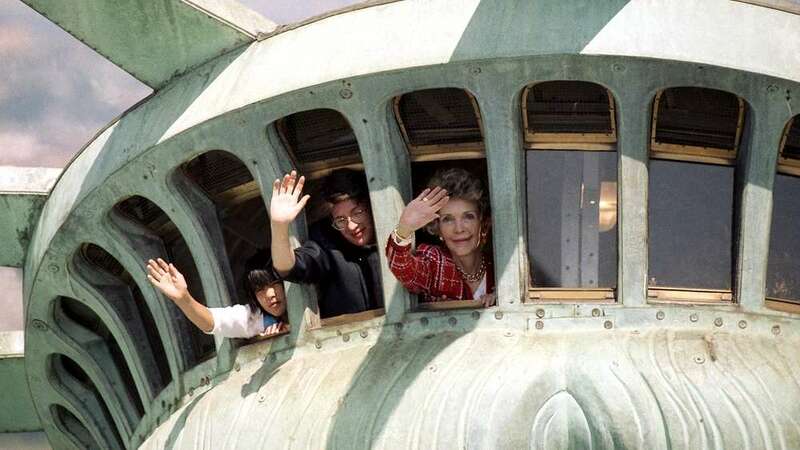 The first person to visit it was Nancy Reagan, wife of US President, who made the journey that we know today with several American and French children. Photo of Nancy raising her hand to wave to photographers boarded a helicopter became very famous. It is after passing that things went awry for the organizers. The first people who landed on Liberty Island were enthusiastic about the facilities, but once the tour ended they did not want to leave to enjoy this moment they had waited for hours. The organizers believed that everyone was going to hurry to move to make way for the following, but it was not. A huge cap caused great discontent because a lot of people could not go there. It must be said that New York, these days, were invaded by a large crowd, it was estimated that the population had doubled. At 16:30 took place a race airships above the Hudson. With 12 miles of distance, the George Washington Bridge to Battery Park, the competitors who had lined up trying the game for a good cause. The winner took a little over 15 minutes. The festivities continued the next day in the late afternoon in Central Park. Central Park, the huge New York park, used giant concerts. Several personalities of the pop song had occurred here, as Elton John and Simon and Garfunkel. To close the day a giant concert was organized there, proposed by the New York Philharmonic with Zubin Mahta to commands. The ceremony was presented by Kirk Douglass and Angela Lansbury, known for her role in the crime series "Murder." Quickly they called France where, Place Vendome, another concert was organized. Thus the two ceremonies could take place at the same time, by interposed screens. In New York the big names were on stage: Placido Domingo, Yoyo Ma, Leona Mitchell. The closing ceremony took place in the American football stadium in New York, the Giants Stadium. Physically on the ground of New Jersey, it was the largest enclosure around the statue and thus best placed to host the best possible world. The closing ceremony was involving many personalities from show business and remained in the memories. Of course, that says grand ceremony said TV show, especially for Americans who know how to use this medium to reach large numbers of people. The whole ceremony was organized by David Woolper, a well-known producer in Hollywood at the time. It was set up by the ABC television channel that had bought for gold broadcasting rights in the United States and, even today, when looking at the images, they are siglées logo "ABC". 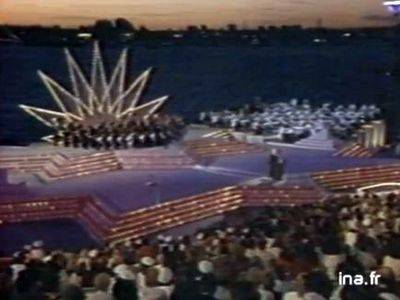 In France the ceremony was partially broadcast by "Five", a TV channel no longer exists today. The show was also broadcast in several stages of football in other major cities in the United States, and even in New York it was at Giants Stadium. 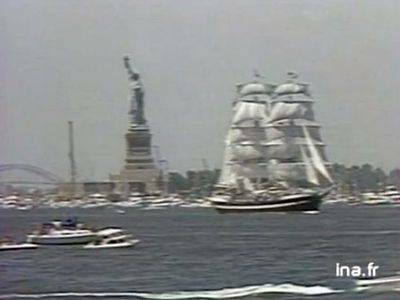 The centennial of the Statue of Liberty was not only celebrated for a weekend, there has been before, and the day after, still many manifestations about it. Regarding the French one of the most important - and media - was the tour has made the Patrouille de France for more than 7 weeks in the United States. In culminating of course, the passage of the French Alpha jets over Ellis Island in front of the spectators came to see the festivities of the "Liberty Week" on 4 July. This ceremony was also a great moment for Franco-American relations. The presence of the two presidents was only a symbol, but everything was done during those three days to put forward the French know-how in the United States. So Danielle Mitterand spent much of Day 3 of the afternoon on a junk in the port of New York, to discuss with fellow who decided to settle in the United States for their activities. The majority were fashion designers. During the day the Ambassador of France to the United States confirmed the importance of the French community in New York. It is October 28, 2011 that took place the ceremony to celebrate the 125th anniversary of the Statue of Liberty. It was an opportunity for the deputy of the French riding Colmar, to make the trip with a small Alsatian delegation during which he was presented with a plaque bearing the inscription "In memory of the friendship gesture France ". In all, nearly a thousand people attended the commemoration. The celebration of celebrations marking the 125th anniversary of the inauguration of the statue began with a naturalization ceremony for 125 immigrants from over 40 countries, including Haiti, Honduras, China, Croatia and Senegal. French was part of a lot, it became American by marriage. Then, according to the official program at 10 am the star Sigourney Weaver read the poem by Emma Lazarus "The New Colossus" and Secretary of Interior Ken Salazar presented the Friendship plate French deputy in thanks for their gift of the Statue of Liberty in 1886. George Cleveland, the grand-son of US President who inaugurated the statue in 1886 was present. It was the first time he set foot on Liberty Island. The ceremony continued with a performance by singers musicians, orchestrated by Michael Feinstein, then by a naval parade, like the day of the inauguration and of the centenary, but more modest, however. "The significance of the statue has evolved since she graced our shores 125 years ago." This was said David Luchsinger, superintendent of the Statue of Liberty and Ellis Island. "She began her life as a symbol of friendship between France and the United States, she became a symbol of our great country, and is known today as an international symbol of freedom for the people worldwide. This Friday is a time to celebrate her legacy. " The celebration ended Friday at 19.45 with a fireworks display sponsored by Macy's, which for the first time in 25 years, has featured fireworks launched from the island itself. This show of 12 minutes was accompanied by patriotic songs, including "God Bless America" and "The Stars and Stripes Forever." After the ceremony, the Statue of Liberty was closed for a year for renovations, but Liberty Island remains open to visitors.